Aiseesoft iPad Manager for Mac, an all-in-one tool for iPad users can both backup the audio, video, image files on iPad to Mac and import audio, video files or folders, photos to your iPad. Moreover, Aiseesoft iPad Manager for Mac can assist you to import your iPad files to iTunes for backup, load your local files to your iPad and transfer iPad files to local disk without worrying the problem of losing files. Also you can make your individual iPhone ringtone with this iPad Manager for Mac. Manage audios, and videos on Mac to iPad directly and the managing formats are compatible with iPad supporting formats. Convert videos, audios, recordings, MTV albums to iPhone M4R ringtone. 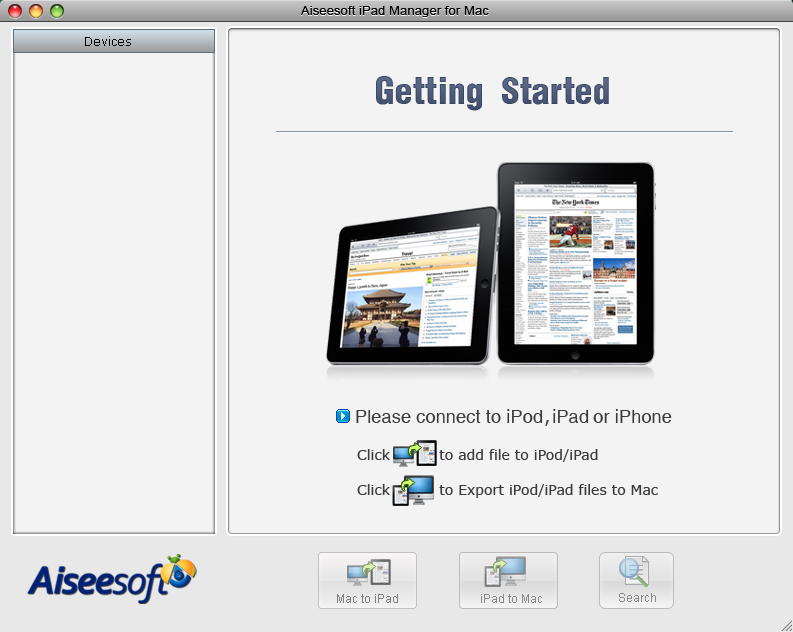 Aiseesoft iPad Manager supports all iPad/iPhone/iPod models and transfers iPad files with high speed.